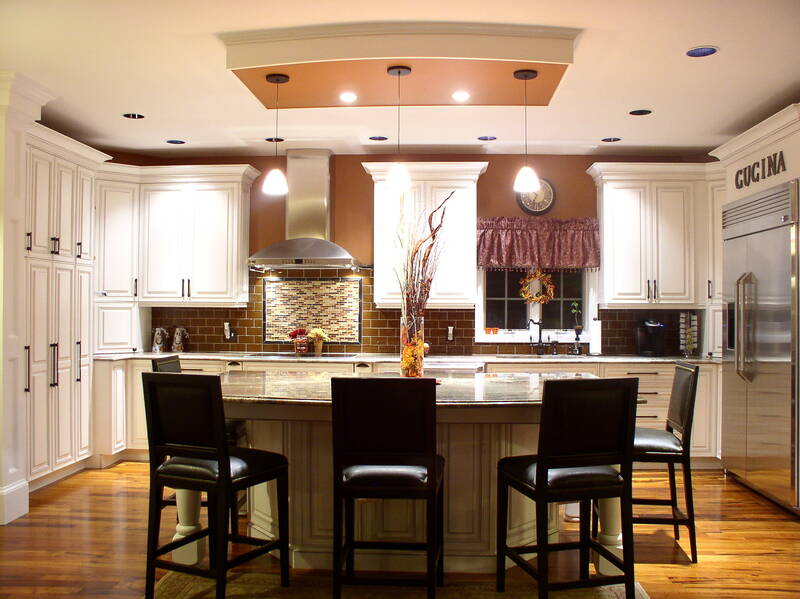 How do you go from a dark stained, traditional kitchen to the warmth of your family heritage? You start over! The old kitchen in this more modern house was a typical 15 year old builder-grade dark cherry traditional style kitchen that had very little form and function. The cabinet doors were falling off of their hinges and the drawers would hardly open. The black counters further darkened the gloomy space and the island was so small it was hardly usable. The owners were doing a full “face-lift” throughout the first floor to incorporate an old world italian style with a modern flair! New european wood floors, columns, leather and wood furniture and family treasures hanging on earthy toned walls transformed this house into a home. For the cook in the family, I added professional series appliances, a big island and plenty of storage with pull out pantry and tall storage cabinets along with plenty of drawers and roll out shelves making this anyones dream kitchen. The glazed, warm-toned cabinets and rustic stone counters create a comfortable “lived-in” feel, yet brighten it up enough to focus on the task at hand. Buon Appetito!